Many school districts constructing new areas, or renovating existing areas to add STEM classrooms and labs. STEM traditionally stands for Science, Technology, Engineering, and Mathematics, however, the terms STEAM (adding A for art) and STREAM (adding R for research and A for art) are also used to describe this learning concept. We find that this learning discipline means something different for each school district, but all incorporate the concepts of collaboration and classroom flexibility to create an active learning environment for students. Interior Concepts has been building furniture for schools and technology labs for 20 years and has worked with districts across the United States designing STEM labs within schools. 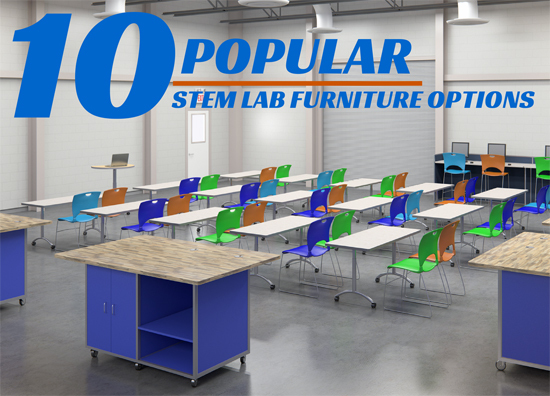 Check out the presentation below that shows our 10 most popular furniture designs for STEM labs. STEM Lab furniture needs to accommodate both individual and team work spaces, provide technology workstations, and allow flexibility as activities change from large to small groups. Careful planning for these dynamic STEM classrooms, including layout and furniture needs, is a critical component for meeting the long-term needs of students and staff. Interior Concepts can help you plan your STEM lab. Please give us a call at 800-678-5550 to start a no obligation quote.